where Ej/Ng is the ratio of received energy-per-bit to noise-density, Pis the transmitter power, L¡ is the transmitter-to-antenna line loss, G( is the transmit antenna gain, Ls is the space loss, La is transmission path loss, Gr is the receive antenna gain, k is Boltz-mann's constant, Ts is the system noise temperature, and R is the data rate. The propagation path length between transmitter and receiver determines L¡, whereas La is a function of factors such as rainfall density. In most cases, an Eb/N0 ratio between 5 and 10 is adequate for receiving binary data with low probability of error with some forward error correction. Once we select the orbit and determine the transmitter-to-receiver distance, the major link variables which affect system cost are P, G¡, Gr, and R. Rain absorption also becomes a significant factor at radio frequencies above 10 GHz. Figure 13-5 illustrates the key relationships between power of the satellite's transmitter, diameter of the ground-station antenna, and data rate for the downlink. These parameters are nearly independent of frequencies between 200 MHz and 20 GHz under clear weather conditions. 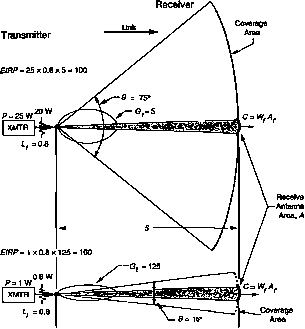 The required transmitter power is relatively independent of satellite altitude when the antenna beamwidth is set to just illuminate the coverage area indicated. At low altitudes the required transmitter power is reduced in the Earth coverage case because the area in view of the satellite is smaller. Fig. 13-5. Satellite Downlink Characteristics. 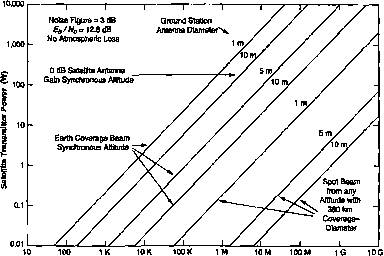 The required transmitter power is relatively independent of satellite altitude for constant coverage. At low altitude the required transmitter power is reduced in the Earth coverage case because the area in view of the satellite is smaller. The power is relatively independent of carrier frequency between 200 MHz and 20 GHz in the absence of rain and antenna-pointing error at the ground station. Consider a transmitter located at the center of a sphere of radius S, radiating power PLi isotropically, and thus uniformly illuminating the surface of the sphere. The power flux density, Wf, received on the sphere's surface is the radiated power divided by the area of the sphere, that is, PLt/4jtS2.The radiated power is the transmitter power, P, reduced by the line loss, Lt, between the transmitter and the antenna. 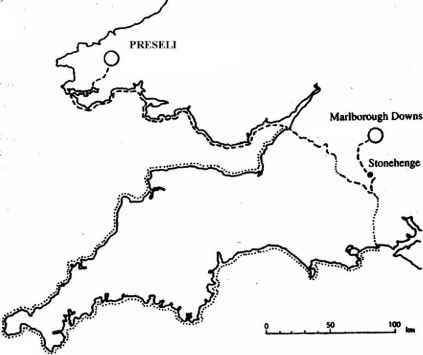 where Wf is typically expressed in W/m2. PLfi, is called the effective isotropic radiated power, or EIRP, in watts. In Fig. 13-6, the same E1RP and received power flux density is produced two ways, one using a high-power transmitter, the other a low-power transmitter. The difference between them is that the approach using a low-power, high-gain antenna illuminates only a limited coverage area, which may or may not meet the mission requirements. Fig. 13-6. Trade-off between Antenna Gain and Transmitter Power. These two communication links have the same EIRP, received power density, and received signal power. However, the 1-W transmitter with the high-gain antenna has only 1/25 the coverage area provided by the 25-W transmitter with low-gain antenna.